​​ VALLEY RANCH – CHI St. Luke's Health to be part of the new Vivacity development, a 186-acre medical district ​located in Valley Ranch. 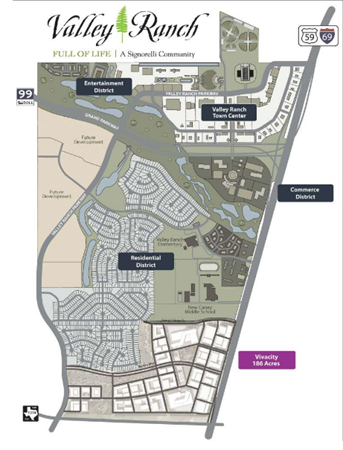 The medical district will comprise 186 ​acres in Valley Ranch—a 1,400-acre planned community in the New Caney area at the intersection of Grand Pkwy and US 69. Vivacity’s master plan calls for more than 2.5 million sf of health, wellness and life science facilities along with hospitality, retail and other services. ​Read m​ore about Houston medical market research here.